Inspired by the brutal training that the HBO series’ Arya Stark character endures at the hands of the Faceless Men of Braavos, the cans, when at room temperature, appear to be brandless -- stark (pun intended) white, in fact. 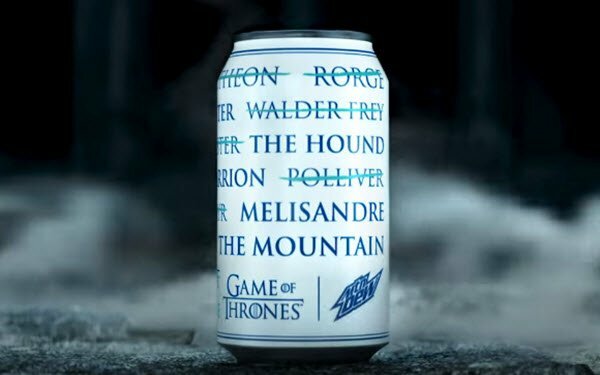 But when chilled, the cans -- thanks to thermodynamic ink -- reveal the names from Arya’s “kill list,” along with the Mtn Dew and “Game of Thrones” logos. To try to win one of the cans, fans around the country can post on Facebook, Instagram or Twitter about what they would sacrifice #ForTheThrone, using that hashtag plus #ACanHasNoName and #MTNDEWsweepstakes. Mtn Dew teased the special cans promotion with a “Game of Thrones”-themed short video, featuring NBA All Star/brand rep Joel Embiid, posted across Mtn Dew’s social channels. The video has already generated 1.5 million views on Twitter alone. The brand also temporarily removed all branding on its social channels, including profile photos, cover photos, and archiving Instagram posts, to allude to its “ultimate sacrifice” for The Throne. Mtn Dew also posted a 20-second YouTube video (below) showing the can’s cold-induced transformation process.